Why is the UK still knocking down historic cinemas? The number of cinemas in the UK has fallen hugely since World War Two. Is enough being done to ensure historic venues are preserved? The bulldozers are waiting to smash the Futurist. For 70 years the cinema packed in up to 1,000 people a showing, seeking thrills, laughter, news. 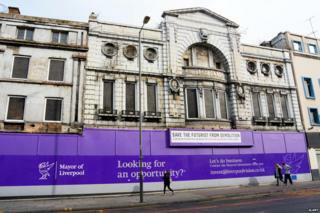 It closed in 1982 and now all that is seen of the building in Liverpool's Lime Street is its blocked-up facade. Even this is due to go soon, after the council granted permission for a £35m redevelopment of the run-down shopping and entertainment area. Opened in 1912 as the Picture House and once admired for its marble-walled auditorium and plaster work, the Futurist is set to be demolished later this year, with Liverpool Mayor Joe Anderson saying a revamp of the area is "long overdue". Neptune Developments, which is overseeing the project, has said the "poor structural condition" of the facade means it cannot be saved. Campaigners have been fighting to preserve the building, and some wonder whether enough is being done to protect the UK's cinematic heritage. "Early cinema facades like this are increasingly rare and should be valued and protected," says Christopher Costelloe, director of the Victorian Society. In London, the Odeon West End, which has hosted many film premieres, is in the process of being demolished and rebuilt as a 10-storey block comprising a hotel, spa and a two-screen cinema. Campaigners were not able to gain listed status for the 1930s building. Hull's National Picture Theatre has lain unaltered since it was bombed during WW2. Its future is uncertain. The fate of historic UK cinemas is similar to that faced by Victorian buildings during the 1960s, says David Trevor-Jones chairman of the Cinema Theatre Association. Only campaigns by figures such as the poet John Betjeman saved buildings thought of by modernisers at the time as "ugly" or "grotesque" but which are now recognised as important, he argues. "A few years ago, for a decade or so from the mid-1990s, there was more a swing towards historic preservation of buildings," Trevor-Jones says. "But the pendulum seems to have swung back in favour of redevelopment again. Cinemas are among the buildings coming under greater pressure. We need more advocates for preservation. " Cinemas in the UK have a tumultuous history. By 1914, only about 20 years after the first films were shown in the country, 4,000 venues were in existence. After World War One many of these disappeared, replaced as operators took part in a race to make premises ever-more attractive. Ornate "super" cinemas or "picture palaces", offering extra facilities such as cafes and ballrooms came to towns and cities. Green's Playhouse in Glasgow opened in 1927 with 4,254 seats, the largest total for a single cinema auditorium in the UK. The Futurist in Liverpool survived this cull with a few amendments, such was its quality, but some 4,000 new cinemas were built between 1920 and 1940, particularly as "talkies" - films with sound - took hold. Carpets, heating, chandeliers, plush seating and frescos greeted visitors as they came in to watch such stars as Clark Gable, Laurel and Hardy, the Marx Brothers, Mickey Rooney, Shirley Temple and Joan Crawford. "These places were often built in otherwise unremarkable parts of towns or cities," says Trevor-Jones. "People mostly came from houses that lacked central heating, probably only having one warm room, with a tin bath out the back. They walked into a world of luxury. And as a social meeting place it was unrivalled, particularly for women, who didn't go to pubs. People met, fell in love and got married." Trevor-Jones argues that, in the 1930s and 1940s, cinemas "were the public realm" in many areas, providing a social life and access to news, including moving pictures of the Royal Family and politicians that were unavailable elsewhere. They have lost this position. From a post-war total of 4,700, numbers fell to 3,050 by 1960 and 1,971 by 1965, as television's popularity grew. They suffered again in the early 1980s as home videos became widely available. By last year, there were 743 working cinemas in the UK. But the nadir for UK audience numbers came in 1984. Despite this being a year of blockbusters including The Terminator, Ghostbusters, A Nightmare on Elm Street, Beverly Hills Cop, Gremlins and Supergirl, only 54 million visits were made. Many preferred to stay at home, able to rent films on video cassette just a few months after their cinema release. The 1984 attendance figure was less than 1/30th of the 1.635 billion cinema visits of 1946, the all-time peak. Something needed to be done. In 1985 came the opening of the UK's first purpose-built "multiplex" cinema - hosting five screens or more - at The Point complex in Milton Keynes. With 10 screens, and its red-framed 70ft step-pyramid shape visible from afar, it aped the latest developments in US suburbs. Providing vast food and drink choices and easy access for drivers, it became highly successful and its format was widely copied. But, as happened to many of its cinematic predecessors during the 20th Century, The Point started to look dated and was superseded by the nearby Imax cinema. It showed its last film in February this year, before being demolished to make way for a shopping development. Historic England, the body that advises the government on buildings to be preserved, rejected an application for The Point to be listed. The venue was not yet 30 years old, with only buildings of "outstanding quality" able to overcome this time stipulation. The organisation noted it had "some claim to historic interest" because of its pioneering effect on the cinema industry in the UK, but this was not enough to save it. It was "in essence, a large industrial shed unit", it reported to the disappointment of campaigners who had developed an affection for the place. The pyramid exterior, iconic to many in and around Milton Keynes, didn't sway Historic England in The Point's favour either. But its successor multiplexes now dominate the market. By last year the average number of screens per UK site was 5.3, according to the UK Cinema Association. Even before the multiplexes, many of the older single-screen cinemas were subdivided to provide more auditoriums, allowing more films to be shown but reducing their atmosphere, according to enthusiasts. Some of the most architecturally important buildings which serve, or once served, as cinemas have been protected. In England, 245 have gained listed status. Many have become bingo halls, snooker clubs, or places of worship. Trevor-Jones fears that more former cinemas could become difficult for the public to access - for instance, being taken over by religious groups. "The whole point of cinemas was that they were built as public places," he says, "and that would be a great pity." UK cinemas have declined in number but the UK cinema industry is in better health than during the 1980s. Last year they had 157.5 million visitors - more than three times the amount in 1984. And there have been successful renovations of several abandoned interwar picture palaces. The Plaza in Stockport has been fully restored as a working cinema since closing as a bingo hall in 1999. After the Art Deco Regal in Evesham, Worcestershire, closed in 2003, the Wiper family led efforts to restore it. It reopened in 2012. Another Art Deco cinema, the Odeon in St Albans, Hertfordshire, reopened last year, renamed The Odyssey. This and the renovation of The Rex in Berkhamsted, Hertfordshire, in 2004, were overseen by entrepreneur James Hannaway. Earlier this year, the Regent Street Cinema in central London, regarded as the most historically important in the country, made a comeback. It cost £6m to return the space, first used to show films turned via a hand-projector as early as 1896, to this purpose. The Futurist seems to have no future. But Neptune Developments has promised to ensure it isn't forgotten. As Lime Street is renovated, panels will be placed near the cinema's former site. Etched on them will be designs to remind shoppers and bar and cafe-goers of the area's lost heritage.